NieR: Automata is one of the best games this generation and Square Enix is planning on releasing the NieR: Automata Game of the YoRHa Edition for PC and PS4 which includes all previously released DLC. Recently, Square Enix provided a glimpse at the dynamic theme available for PS4 versions of the game. Unfortunately, we only get an image and not the fully dynamic theme. For those unaware, dynamic themes on PS4 not only change the background but icons, move, and place unique sounds from the game the theme is from. 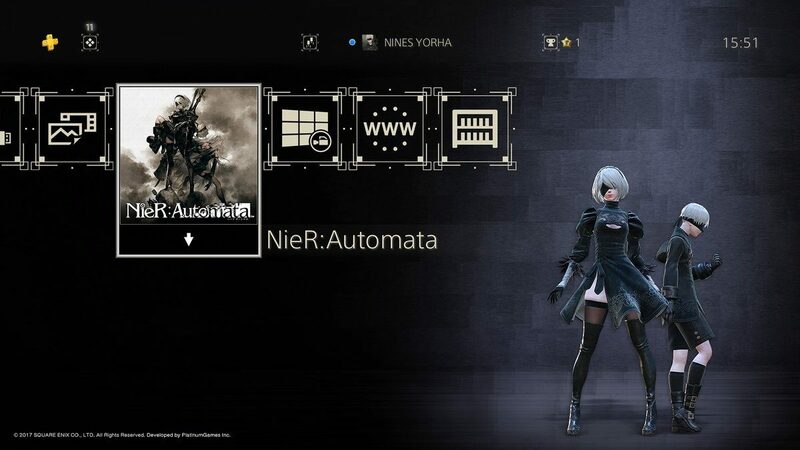 The theme can be purchased but will also be given away for free to anyone who owns a copy of NieR: Automata. NieR: Automata is one of the highest rated games this generation, moving 3.5 million copies as of December 2018. NieR: Automata is now available for PS4, PC, and Xbox One. Check out our review here. The Game of the YoRHa edition launches this month and will include the base game as well as the 3C3C1D119440927 expansion and the Machine Mask Accessory. Four new Pod designs are also set to be included in this edition: Grimoire Weiss, vintage gray Pod, red vintage Pod, and cardboard Pod. Those who purchase the game via PSN also get a selection of fifteen PSN avatars, the Pod console skin, and the amazarash Head Pod Skin. Steam purchasers get two wallpapers, which is a pretty weak offering.